There are over 7,7 billion people on the Earth and over 4 billion of them have an internet connection. It means more than half of the world is online, and while this brings many benefits, it also throws up a lot of problems too. The number-one issue anyone who uses the internet faces is online security. The more people have internet connectivity, the greater the chances that their computers, laptops and mobile devices will be infected with malware, spam and viruses. According to Excello company and its services (such us Virusfree antivirus and antispam service) there are approximately 8,839,416 IP addresses infected around the world, sending a big amount of unwanted emails into CEE region. It’s not difficult for a hacker to take control of your PC and use it for their own purposes, and with some seriously sophisticated hackers out there, you may not even be aware that it’s happening. A single attachment or ‘trojan’ virus could easily get into your PC, giving the hacker remote access and the ability to control your device. They can then use your PC to send out viruses to hundreds of other recipients, including everyone in your device’s address book. The largest number of infected IP addresses is in China. This is not a big surprise because China has the largest number of internet users per capita. According to our analysis, Asian IP addresses are a particular favourite among cyber criminals as it gives them the greatest digital ‘reach’. Other highly targeted regions include Vietnam, India, Taiwan and Pakistan. 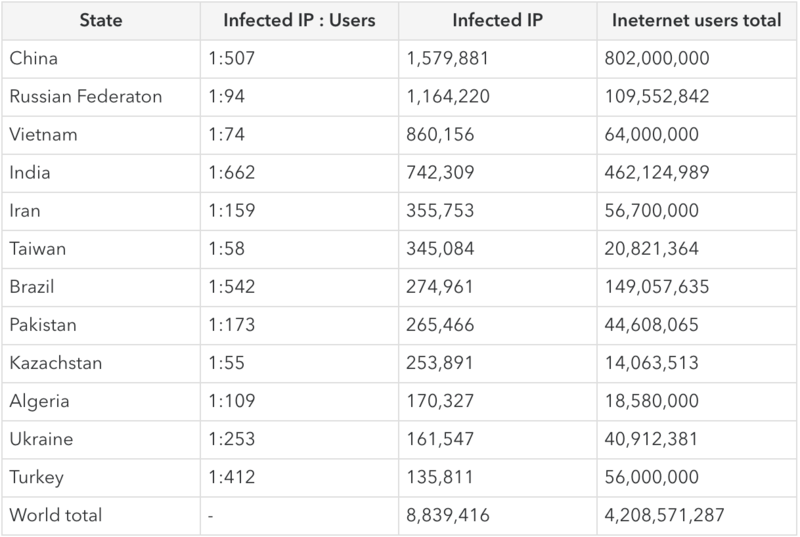 Russia is second on the list of the most infected IP addresses. Compare with rest of the world, number of infected addresses in Europe is around 1% - 2%. We are using this data for the Excello services, same as for the implementation into your own cybersecurity solution (such us SIEM). The easiest way how to flag up a potentially dangerous email was to check the sender. There was clear indications that it is ‘suspicious’ – for example, the email was in a language you or any of your regular contacts don’t use (Chinese or Arabic, for example), or in your native language but with very poor grammar, because the attacker has used an online translator to build the message body. But these days bad English or poor grammar, and even the identity of the sender is not a guaranteed way to identify rogue emails that may be infected with a virus. New spammers and hackers are becoming more sophisticated and their texts are more convincing. Still, the language is one of the most important aspects which you should examine if you are sent any suspicious emails, but keep a lookout for suspicious IP addresses as well. We sent a confirmation link to your email. Thank you.